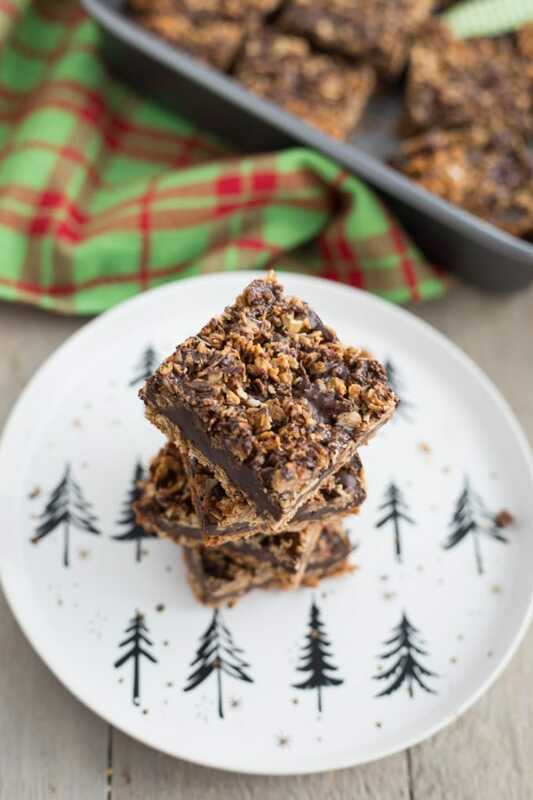 Finishing off this holiday baking season with Chocolate Chai Spice Crumble Bars! It’s only 4 days until Christmas Day and this is probably my last cookie recipe for 2017! I still have a few Christmas cookie recipes to share, but December just flew by, so I guess I’ll just put those in my back pocket for next year. In the meantime, this is not my last post for the year. I have one more to share before Christmas that’s not cookie related, but perfect for Christmas Day or Boxing Day, depending on what type of meal you’re planning. So keep an eye for this recipe over the next day or two. But for now, I should probably tell you all about these Chocolate Chai Spice Crumble Bars. These cookies may not be your typical festive cookie, especially compared to peppermint mocha fudge brownies or gingerbread cookie cups. But these bars are super delicious, and I think they might be my new favourite cookie this holiday season. They are easy, clean eating and super chocolatey! And the chai spice adds a subtle taste of Christmas without being overwhelming. So perfect for year-round enjoyment! 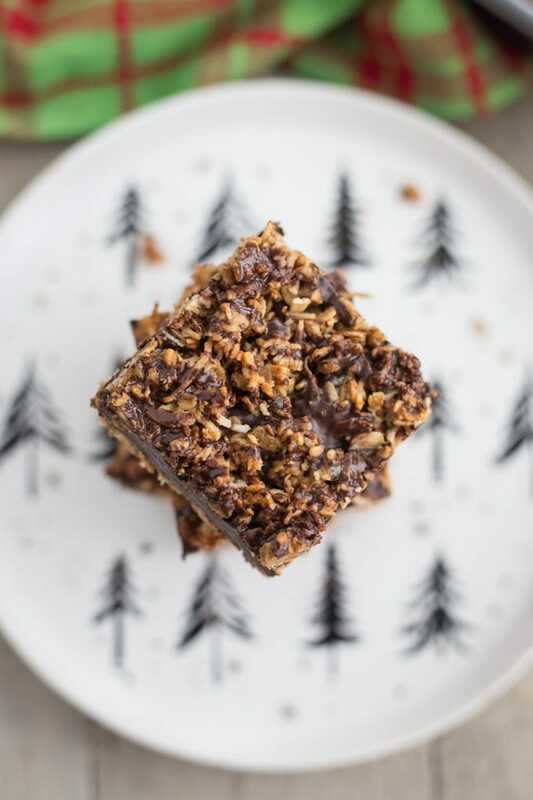 While these Chocolate Chai Spice Crumble Bars are categorized as dessert, they could just as easily be for breakfast. With all the oats, coconut, almond butter and honey, it’s kinda hard not to think of these as breakfast! I know they have lots of chocolate, but it’s the holiday season after all, so chocolate for breakfast is not only appropriate but required! I have two batches of these made and ready to go in the freezer. So I’m totally prepared for impromptu gatherings or a lazy holiday morning with a large cup of coffee! If you give these a whirl over the holidays, be sure to let me know how it goes in the comments below. Or take a pic and post it to Instagram. Just tag @crumbtopbaking so I’ll see it! 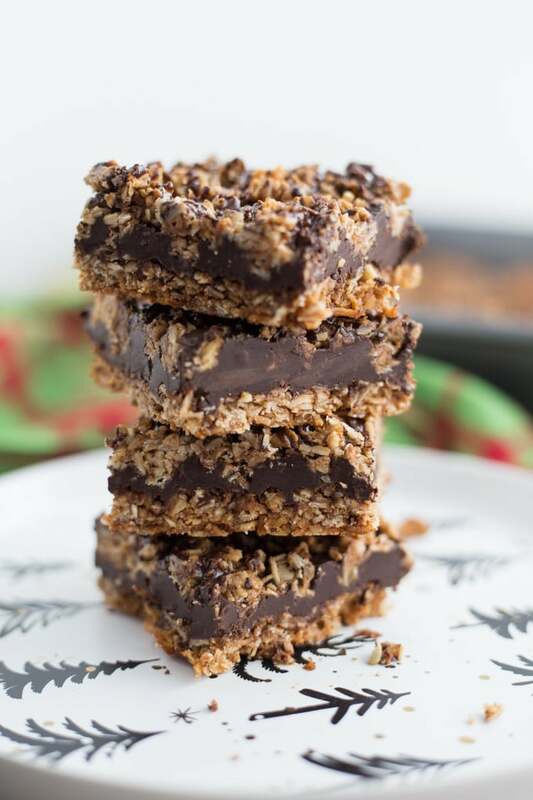 Chocolate Chai Spice Crumble Bars are loaded with oats, coconut, almond butter, honey and chai spice, and have a delicious dark chocolate ganache filling! So good, you won’t be able to resist eating dessert for breakfast! The chai spice recipe is from Fit Foodie Finds. I love how low sugar these are!! I’m sure they taste amazing. Chocolate and chai is a great combo! Isn’t it nuts that we’re posting “final recipes” of cookies and things? Time just goes SO fast. I can’t wait to see what you’ll have in store for 2018! Cheers, Leanne! Chocolate is definitely required for Christmas breakfast 😉 These look so chocolatey and moist and jam packed with all kinds of yummy flavours! Love that you made a couple of batches and good to know they freeze well. I, more times than not, freeze my baked goods. Otherwise, it would be too tempting to finish it all off quickly, lol. Cheers to a fabulous Christmas and wonderful 2018, Leanne! Thanks Dawn! Yep, I’m all about freezer cookies! They make a great dessert in a pinch and it definitely removes temptation! Happy Holidays to you too! Thanks Ashika! I love the chai spice in these bars! It pairs really well with the dark chocolate. I hope you get a chance to make them. Happy holidays to you and your family! 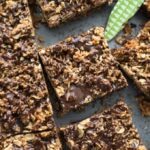 I love both chocolate and chai more than words can describe, so these Chocolate Chai Spice Crumble Bars are right up my alley!! 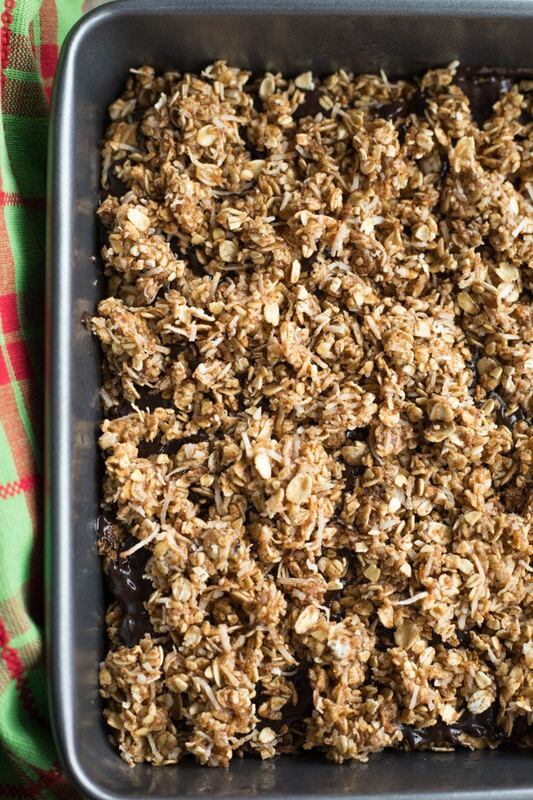 This is such a great dessert for the holidays – I feel like all I have been doing for the last couple weeks is munching on holiday sweets. Great photos too! Thanks Alia! I totally agree! The month of December has been filled with eating out, snacks and sweet treats! But it’s all so good! Happy Holidays!! These look great! Do you think maple syrup could be subbed for the honey? Thanks! 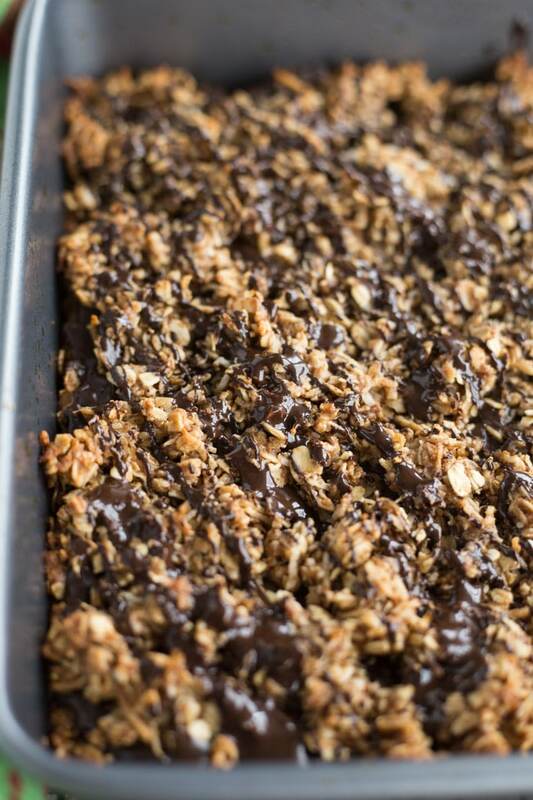 I’ve never tried making these bars with maple syrup. 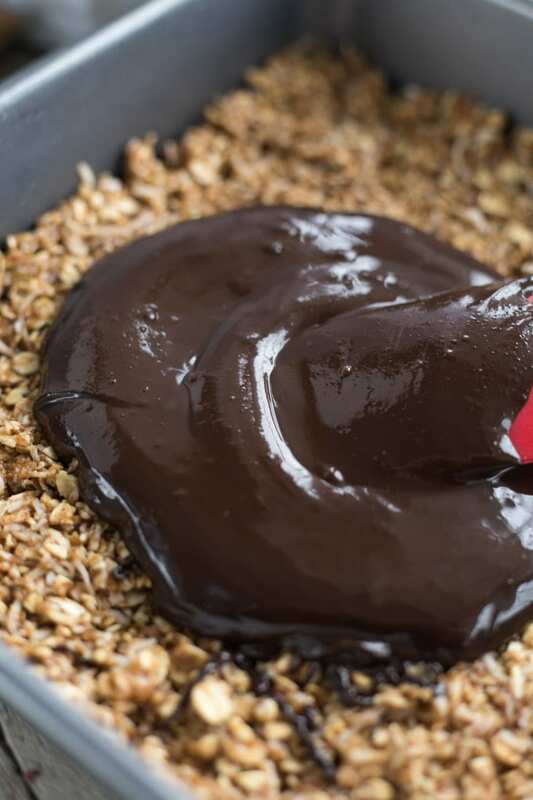 It may work just fine, but maple syrup is not as thick as honey, so I’m not sure it would work as well in binding the oats and coconut together. And it would have a slightly different taste. If you give it a try, please let me know how it goes! These look really tasty. And I agree, chocolate for breakfast is great! This looks like a really healthy dessert or snack. Definitely pinned for later! Thanks Amy! I hope you get a chance to make them. Be sure to let me know if you do! Have a great week! Thanks Heather! 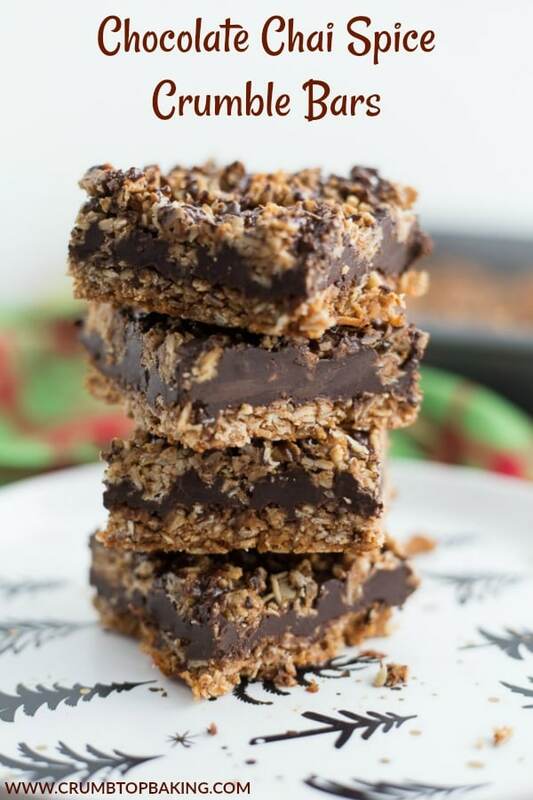 The chai really works in these bars and I love baking with almond butter! Thank you! They have a great flavour, but aren’t overly sweet. Hope you get a chance to try them! 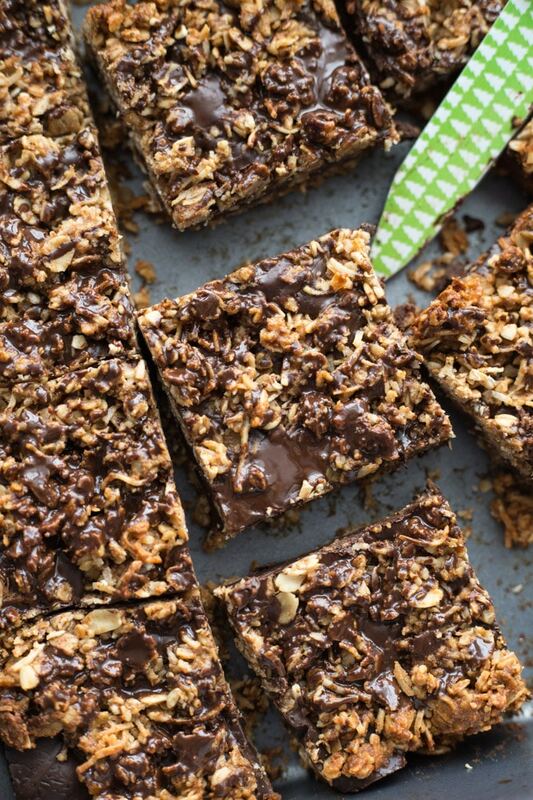 Oh my WORD, these bars look utterly scrumptious! I love the chai spices in them and know they would not last long in our house! Thanks Erin! They never last long in our house! They’ve turned into a Christmas favourite!